With the demand for earthquake proof house designs increasing every day, more and more New Zealanders are asking us why Fraemohs Solid Timber Homes perform so well in earthquakes compared to conventional houses. And the answer? Innovative design and earthquake proof building materials. In conventional timber and steel stud homes, the wall studs are typically set at 600mm crs with two rows of dwangs braced by metal angle bracing and plaster board. During an earthquake these walls can twist and break. In our Solid Timber Homes, the walls are solid timber. 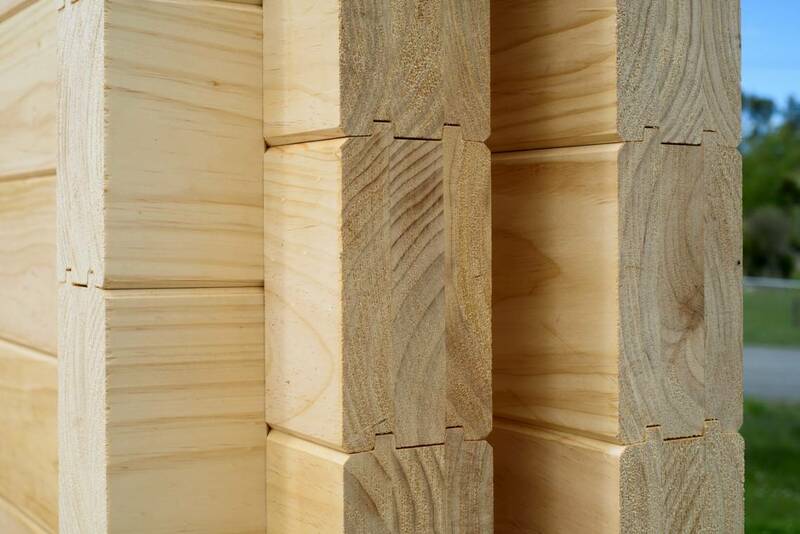 Each wall plank consists of three laminated timber boards, making them stronger than one piece of timber the same thickness. And each plank interlocks with the next, creating strong joints between planks and at the corners. There’s also no separate framing, cladding or lining in our Timber Homes – just a solid timber structure – allowing the house to flex as one during an earthquake, rather than twisting out of shape. New Zealand homes are designed to not collapse during an earthquake and protect from loss of life. That’s not to say the home won’t still suffer damage beyond repair. But a Fraemohs Solid Timber home typically survives earthquakes undamaged, which is great for the people living in them. The beauty of a Fraemohs Solid Timber Home is the safety and durability it provides. Following an earthquake proof house design and made with earthquake proof building materials, the interlocked solid timber structure means you won’t have to deal with repairs if an earthquake hits. And that’s peace of mind, for you and your family. For further reading and more accounts from Fraemohs homeowners throughout the earthquakes, please visit our Earthquake Resistant Homes page, as well as our Timber Homes page. NB: The photo at the top of the page is of one our Solid Timber homes which was situated literally 30 metres from one of the fault lines which opened up in the recent Waiau earthquake. The surrounding land, and many homes were destroyed or badly damaged. This Fraemohs kitset home however came through unscathed.